RCS & Associates Represents Better Engineering's full Line of Parts Washing Systems solutions. Better Engineering has been pioneering standard parts cleaning systems since 1960. For more than 50 years, Better Engineering has manufactured high quality, automatic industrial parts washers and parts cleaning systems utilizing spray, immersion and ultrasonic technologies. BE cleaning systems use detergents that are water soluble and biodegradable, making them safer for the user and for the environment. Better Engineering has the highest caliber engineering staff in the industry. Utilizing innovative design software, we are able to build great, unique parts washing systems to solve any particular cleaning problem. For more information contact an RCS & Associates Better Engineering Washer Systems representative. 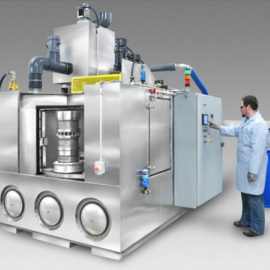 Better Engineering builds Automatic Spray Washers with Industrial Quality for "Wash Only" applications. All units carry "BE" Guarantees. Genesis Part Washers feature Erogonomic 31-inch Loading Height, Vertical Seal-less Pumps, Jam-Proof Turntable Drives, Mid-Swing Cleaning Manifolds, 30-minute Wash Timer, 12-hour Heat Timber, Sealed Cleaning Chamber, Slide-Out Chip Basket, and BE's Lifetime Guarantee! 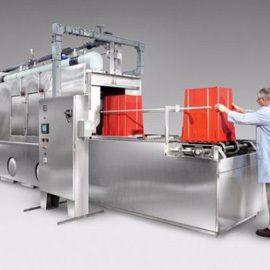 Optional features include "ZX" Upper Turntable Baskets, 230V / 460V 3-Phase Power, Automatic 7-day/24-hour Timer, Casters, Oil Skimmer, Brush and Pump for Hand Cleaning, Automatic Water Fill, Steam Exhaust, In-Line Strainer, In-Line Bag Filter, and Insulation. Click here to view Spec Sheet for the Genesis series of parts washers. Better Engineering offers four (4) product families of Turntable Style Washers. Sizes range from 27-inch to 180-inch diameter turntables with up to 50,000# capacity. All cabinet styles are available in mild steel or stainless steel. Genesis Washers are ideal for smaller repair and work centers. They feature wash only stage. Two models available: G-2000 and G-3000. Purifier Washers are for heavy-duty cleaning. They offer Wash stage, with optional rinse and dry stages. Ultima Washers are for the highest possible levels of cleaning. They offer multiple rince and dry stages. 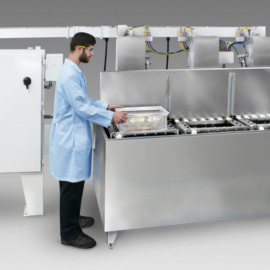 Custom turntables offer a unique parts washing system to solve specific cleaning problems. Better Engineering is the leader for conveyor parts washers. The Cyber-jet line of conveyor washers are intelligently engeineered, beautifully designed, and have a rugged construction. Standard belt widths are 14", 24", 36", and 48". Better Engineering offers a wide variety of Conveyor Washers, including Belt Washers, Monorail Systems, Multiple Conveying Options (ie. 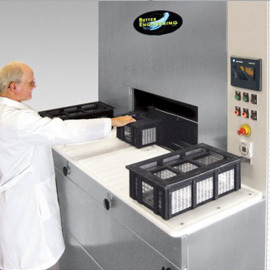 Chain Conveyors with Fixtures), Miniaturized Unites, Increased Belt Widths up to 72" and wider, High Pressure and High Speed Systems, Dunnage/Tote Washers, Tube Cleaning, and Tote Washers, Bin Washers, and more! The Cyberjet C-14, C-24, C-36, and C-48 are standard models of various configurations. Custom Conveyor Washers are also available, based on our standard models customized for your exact application. Visit the Better Engineering website to view videos on this product category. Better Engineering makes Immersion-Ultrasonic Washers with Agitating Platforms (Multiple-speed) Ultrasonic Power, Unlimited Stages, and Full Automation Available. Designed around a 22" long and 14" wide agitating platform, linear guide rails and other features makes this "engine" smoother and more reliable. 3 Types of modules and numerous options make it easy to have the ideal system with unlimited stages. Better Engineering extends the tanks beyond the cylinders that power the platforms. The larger tanks are able to hold more chips and dirt, and keep the contaminants away from the parts. New oil skimming echnolgory results in cleaner parts - before the parts are lifted out of the bath, oils are blown to the "new" rear tank extension and windows power shut to trap the oils in the skimming section. No more side tanks and floor sprawl... the pumps required for agitation and filtration and the oil skimmers are now mounted to the main tanks. The CYCLOJETS clean and dry parts that other parts washers can't - complex screw machine parts and larger parts with blind holes and intricate passageways. 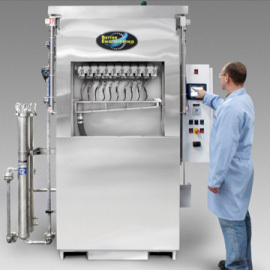 2, 4, 6, or 8 Basket units, Stainless Steel construction, Patented Auto-Latch feature, Spray / Immersion Stages, 2 Heated Tanks, Baskets or Fixtures Available, PLC Control System, and Ergonomic Loading Deck are some of the standard featured included in our Tumbling Washers. 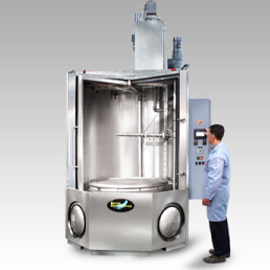 Optional features include Additional Rinse Stages, Drying Stage, Steam Exhaust, Ultrasonic Cleaning, Conductivity Meters, Detergent Injection Pumps, Pressure and Flow Sensors, Sump Tank, Oil Skimmers and Coalescers, Automatic Loading System, Particle Filtration, Bar Code and RFID Readers, and Beacon Lights. Click here to view Spec Sheet for the CJ-2 and CJ-4 Cyclojet Tumbling Washers. Clean small parts in volume with our Drum Washers. Standard drum diameters of 14-48 inches. Continuously welded helix and modular construction. The drums are available in 14", 24", 36", and 48" diameters and are tailored to each application when it comes to perforation size, the pitch of the helix, and the height of the helix. The wet stages can have spray, immersion, or both. 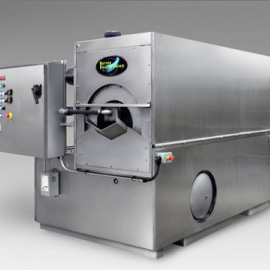 The hot air dryers run as high as 250 degrees F.
Standard features include drum positively driven with a chain, true modular stainless steel construction, insulation / stainless cladding / stainless finish, sealess pumps, hinged access door spray chamber, drying modules, and central control station. RTO Washers are super-compact, designed for work cells and lean manufacturing centers, and often incorporated in automation processes. 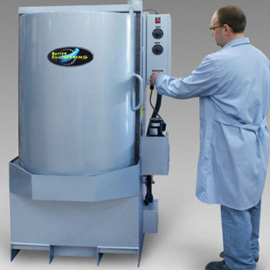 Custom RTO Washer Systems include units with rotors that have rotating, spinning action, multi-chamber systems, etc. Better Engineering makes a wide variety of Custom Washers. Dunnage Washers, Tote Washers, Tube and Pipe Washers, Monorail Washers, Flushing Systems, and more! Better Engineering uses their standard models as the foundation for building unique parts washing systems to solve your specific cleaning problem. They have extensive experience in customizing units for increased height, length, diameter, or weight capacity, as well as high pressure, high speed, and sanitization. Specialty applications include weapons cleaning and more! Please visit Better Engineering on YouTube! Please visit Better Engineering on LinkedIn! Please visit Better Engineering on Twitter! Please visit Better Engineering on Facebook!